Narcotic withdrawal triggers symptoms like anxiety, insomnia, accelerated heartbeat, and hypertension. These symptoms can take up to two weeks to subside. Find out more about what awaits you during withdrawal from narcotics here. ARTICLE SUMMARY: In this article, we review risks and side effects of stopping narcotics. We’ll explain what to expect during withdrawal. Then, we’ll talk about the safest way to detox . Your questions are welcome at the end. Narcotics can relieve pain, induce sleep, or reduce cough. But, you can also easily become dependent on them. So, what is the definition of a “narcotic”? Narcotics are available in both street forms and in legal prescription medications. However, each of these drugs lead to physical dependence and addiction within short time after repeated use. If you want to stop narcotics, but are afraid to do it alone don’t worry, professionals can help you stop using them safely. Doctors, nurses, psychiatrists and other experts who specialize in narcotic dependence and addiction issues can help you cope with withdrawal symptoms. They can make your detox stress-free and less painful. The term “withdrawal” is used to describe the symptoms people experience when they stop regular dosing of a drug. But withdrawal can also occur when you decrease intake of narcotic medications …after a period of physical dependence. Withdrawal symptoms occur whenever a narcotic-dependent person significantly lowers dosage or misses an expected dose of the drug. People dependent on narcotics feel as if they are ill during withdrawal. Typically, narcotics manifest uncomfortable physical and psychological symptoms that mimic a very bad flu. Another way of describing withdrawal would be the opposite effects of the drug itself. So, if the drug makes you feel sleepy, withdrawal feels restless. Likewise, the opposite of slowed digestion is vomiting and diarrhea. If the answer is “yes”, please call our helpline. Narcotics change a person’s brain chemistry. In fact, narcotics have multiple effects on the brain and body. Notably, narcotics block the brain’s perception of pain by binding to opiate receptors in the central nervous system. This way, the communication between the central nervous system and the brain is disrupted. The end effect is an overall feeling of calmness and relaxation. When these drugs are used for a long period of time, the body slows down the production of natural chemicals, becoming less effective in relieving pain naturally. As levels of naturally occurring neurotransmitters decrease, the body builds tolerance for the drugs. This also increases the chances of chemical dependency and addiction as the body is unable to relieve pain naturally. Furthermore, the brain needs to compensate for depressant effects of the drugs. Without a counteraction, you’d simply stop breathing or your heart would stop beating. To keep you alive, the central nervous system stimulates multiple systems of the body. But take away the drug, and these “sped up” functions take time to balance out. That’s what withdrawal is; the period of time it takes for the body to gain homeostasis after drug dependency. Drug dependence is not equivalent to addiction. These states are actually two different conditions. Drug dependence, commonly known as “physical dependence” occurs with regular, daily use of any psychoactive substance, including narcotic drugs. Even legitimately prescribed painkillers will produce physical dependence when taken for longer than two weeks. Compulsive drug seeking and use, despite harmful consequences. Often times, the fear of experiencing pain forces people to continue using narcotics. They will do whatever it takes just to avoid these symptoms. However, continuing to abuse narcotics may cause severe brain and body damage, including death. Know that withdrawal symptoms can be managed and you have little to fear when undergoing a professionally supervised detox. Withdrawal symptoms involve physical and emotional changes. You are looking at anywhere from 7-10 days for the physical symptoms to completely subside and one to three months for the emotional and psychological symptoms to go away. 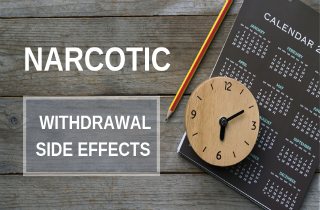 Typically, the timeline for withdrawal depends mainly on how long you have been using, at what levels, and what type of narcotic were you taking. 24 – 48 hours after your last narcotic use. If you used a narcotic with a short half-life, withdrawal should begin to appear within 12 hours after your last dose. But, if you used narcotics with a longer half-life, you’ll begin to experience withdrawal 30-48 hours after your last dose. Once the withdrawal process fully begins, the beginning is marked by muscle aches and pain. Because your muscles have “forgotten” what it’s like to not be sedated, pain can be intense. The first two days of detox are usually the most difficult ones. Withdrawal progresses from mild uneasiness to profound sweats, diarrhea, loss of appetite and difficulties during sleep.People usually feel anxious, which can sometimes lead to panic attacks. 3 – 5 days after your last narcotic use. By this point, the worst of the pain should have peaked, but not completely resolved. Goosebumps, shivers, abdominal cramping, and vomiting are all common symptoms. Slow-acting narcotic withdrawal symptoms should be subsiding. However, long-acting narcotic users may still experience sweating, lack of appetite, trouble sleeping, and digestion issues. Expect to experience diarrhea during this period as well. At this stage of detox you should be able to eat regularly. It is highly advisable that you begin eating small portions and give your body time to adjust itself. 6+ days after your last narcotic use. Once you successfully get to this point in the narcotic withdrawal timeline, you are close to the end of the acute detox journey. The most difficult symptoms have passed, but withdrawal is not quite over yet. Difficulties eating may still be present and it is not unusual to experience nausea and anxiety. These symptoms are treated with medications prescribed by your doctor. Commonly, these symptoms are treated by the short-term use of antidepressant and anti-anxiety medicines or with medication assisted treatment for opiates/opioids. You may want to stop taking a narcotic drug immediately. This drastic method of cessation is referred to as “cold turkey”. One of the most frequently asked questions is whether or not taking this route is advisable. Some people believe that if they stop cold turkey, they will avoid long, unpleasant withdrawal associated with a slow taper. On the contrary, cold turkey withdrawal is more likely to result in protracted withdrawal than tapering slowly. An abrupt, or rushed withdrawal can also cause seizures, psychosis and other serious problems. Abrupt discontinuance of narcotics is dangerous and may not be worth the risk. Even a drastic reduction in dose can result in acute withdrawal reactions. For anyone who wants to come off of narcotics, experts advise that you wean off slowly and have a doctor supervise your taper. This allows the central nervous system some time to readjust to having lower doses of narcotics in the system until you completely quit. Improved overall chances of reaching long term sobriety. Lowered perception of difficulty and/or pain. If you or someone you know is addicted to narcotics consider medically assisted detox a first choice for help. Those who choose to enter a detox program find that the additional help and guidance offered can give them a much better chance to break free from their addiction and lower their risk of a relapse in the future. During your stay at a licensed detox clinic your withdrawal symptoms can be mediated through the use of medications provided by experts who specialize in narcotic dependency issues. There are different recommended methods for tapering narcotics. Some people cut down dosing by 25% a week; others taper by mg.
High dose usage will make a taper last longer. The narcotic drug will be reduced in very small increments periodically in order to allow your body to readjust to the new doses at each stage of reduction. The potency of the narcotic you are taking affect a taper. High potent narcotics require longer time to reduce. Your personal circumstances, overall general health, the stressors in your life, support available and previous experiences with drugs all influence the way you’ll cope and the pace at which you can realistically taper. When starting a gradual narcotic dose reduction it is advisable not to rush the process, especially if you were a chronic user. Further, reduction rate should be based on your individual withdrawal reactions and intensity of symptoms. Finally, a taper schedule must be flexible. If you require a longer period to taper, you can discuss this opportunity with you doctor and adjust it accordingly. Methadone works on the brain and spinal cord to block the “high” caused by using narcotics. It also helps reduce cravings and withdrawal symptoms caused by narcotic use. Revia or naltrexone blocks narcotics from producing their effects on the brain. It does this by blocking the reward of getting high on the specific drug. Naltrexone is a good choice for preventing relapse as well as symptomatic treatment during a narcotic detoxification. Suboxone, a combination of buprenorphine and naloxone is a medication used for withdrawing and detoxing from narcotics. The reason for combining buprenorphine and naloxone is that it reduces the risk of intravenous use. Suboxone is usually taken as a tablet or film and held under the tongue. TIP #1: Bear in mind that the unpleasant symptoms are only temporary, and the rewards for overcoming them are a new life. TIP #2: Instead of fighting symptoms, pay attention to your reactions. Be present during this discomfort. Or, find something to keep your thoughts distracted from the need to reach for narcotics again. TIP #3: If you have the right mental attitude, withdrawal can pass quickly. Fear blocks your intelligence and your ability to think. Therefore trust your doctors, they will make sure everything is going according to plan. TIP #4: When you feel like you are about to give into the cravings, delay for an hour. Narcotic cravings are likely to lessen during that time and if they don’t, try to remain still and sober for another hour. TIP #5: It can be helpful to write a letter at the start of the process where you’ll write in details about your reasons for quitting. Make sure to list your expectations for the future as well. When you feel like your motivation is beginning to fade, look back on the reasons you started. Millions of people have successfully made it through withdrawal. There is no reason to believe you cannot make it. TIP #6: The companionship of other people can be a great help during your detox journey. TIP #7: Chances of making it through detox greatly increase if you withdrawal in a licensed detox clinic. Detox treatment center have all the resources needed to make the process as smooth as possible. TIP #8: Physicians can prescribe medications that will ease your withdrawal discomfort. These drugs are only available in a medical setting. TIP #9: There is no need for you to feel miserable during the period of adjustment. Do something that makes you laugh again, find activities that are enjoyable and look forward to your new life without pain and without narcotics. When detox is guided by professionals, withdrawal symptoms can be managed more successfully. But who can you ask for help? The bottom line is that you don’t need to go through withdrawal alone. Call us and we’ll review your options. If you’re ready for help, we’re here.